Review content: There’s not enough good things that we can say about these lads. We saw them at a showcase almost 2 years before our wedding and booked them on the night. They did our first dance song exactly how we wanted it and they were fantastic to deal with. They were absolutely amazing on the night and our dance floor was full all night! For anyone looking for a band who are a little different I would highly recommend The Hitmen Trio. Our guests are still raving about them and the 3 lads are so sound. Thanks so much guys, you made our night !!! From myself and Owen we just wanted to say a HUGE thank you for playing at our wedding on Friday night! It was such a fantastic night and we would have kept the party going all night with yous if we could everyone is still telling us how good yous were and we couldn’t have picked a better band! Thank you all so much and we will defo come out to see you guys again soon. So sorry this is ridiculously late but I wanted to say thanks so much to the guys for your performance at our wedding. We absolutely loved having you there, and all the guests complimented both the ceremony music & the reception. Thank you also for finding us a band who could play late night as well – that was a lifesaver! Hope all’s going well & you’re keeping busy, hopefully we’ll get to come see you sometime when we’re back in Dublin! Thank you so much for playing for us !! We had so many compliments on the band 🙂 it was a pleasure dealing with you and you made it all so easy organising everything from Canada !! Again thank you so much !! I will be recommending to anyone I know that is looking for a band !! Thanks gents for an electric performance on our big day! People are still coming up to us asking who the band were – so hope your diary is not yet full it will be soon. 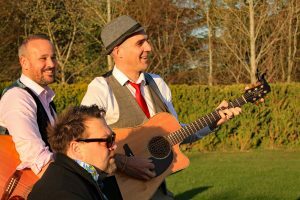 The Hitmen Trio put on a top class show for us… for starters, they went to the trouble of learning our first dance song – and played the jazziest version of a Leonard Cohen song we’ve ever heard! Followed it up with a praise you / daft punk medley and pretty much kept it going from there! The gig really made the night for us and our guests, and when the band were finished Roly’s DJ set kept the dream alive for another 2 hours. Great job cant recommend these guys highly enough! Really can’t thank these guys enough for the amazing nights entertainment they provided at our wedding reception on Saturday. Initially booked for March 3rd we had to postpone the reception due to the Beast from the East. The 3 lads were very accommodating and rescheduled for us. From playing our first dance and a father/daughter dance for my wife outside on the patio with guest lighting the patio with sparklers to keeping the dance floor packed from start to finish they stayed on late to play a few extra songs. Jonny kept the party going as DJ and every guest there was singing their praises at the end. For anyone thinking of booking them get it done quick as these guys are amazing and I’d recommend them to anyone I know looking for a band for a wedding or party. Would just like to say, these guys are amazing. Had them at my wedding yesterday. Would 100% recommend these guys. Dancefloor wasn’t empty the whole night. Also all the guests were singing their praises. The guys played at our wedding in Doolin, Co. Clare in March and we can’t recommend them highly enough. They are so incredibly talented and energetic and they really went to so much effort to personalise the experience for us. They were so pleasant to deal with from the moment we booked them and made the whole thing so stress-free. The set was such that we couldn’t help dancing the night away and all of our guests were so impressed with the variety and quality of the music. Thanks guys for making our day so fun and special! A truly five star performance! The three guys are incredible musicians. My new wife’s family are big into their music and they were thrilled, along with all of our guests with the set played. They are so energetic and really got the crowd going. They are incredibly talented and their song mash-ups are brilliant. The guys played our first dance song (On Top Of The World by Imagine Dragons) for us and even sent us a video of them practicing it a few weeks before so we could practice. They dance floor was packed. The energy the guys bring is amazing and they were all anyone could talk about the next morning. Roly stayed on to play a DJ set late into the night and it was also top class. We had sent a Spotify playlist of the type of music we like and he picked a set of crackers. Thanks so much Jonny, Roly and Romain for making our wedding so special. We’ll highly recommend you to all of our family and friends. The Hitmen Trio were an amazing band to have at our wedding and really made the occasion so special for us. They played our ceremony music, along with the reception and dj. They were so professional all the way through and had absolutely everyone dancing all night. Such nice guys also, and so personable. Cannot recommend them highly enough. We can’t recommend highly enough the Hitmen Trio. The lads put on such an energetic and memorable show for us and our guests. There was a large crowd all night up dancing and enjoying the great songs they played. From day one dealing with them, they were very accommodating and had no problem with any of our requests (I ask them to play a specific song about a week before the wedding) . The DJ set was perfect, after all the energy from the band it was kept going longer into the night. After the wedding most people commented on how good the band were. If you’re getting married and you want a band to make you feel like you’re at a gig rather than a showband! these are the lads for you!! The Hitmen Trio genuinely made our wedding. They perfectly matched our desires for our wedding day. From the ceremony to the DJ, everyone commented on the music and the dance floor was packed! The mash ups made the evening and we have already had friends request their contact details to book them too. We are so grateful to the guys, they are truly talented and completely understood what vibe we were going for! Thanks Lads!! The Hitmen Trio played at our wedding in October. From first contacting them to the day of the wedding they were exceptionally helpful and responsive to all emails and requests. Johnny played a beautiful acoustic set at the pre reception. The band learned our first dance and it was perfect. The evening set was just amazing, the dance floor was full the whole night. The various arrangements were so good, our guests for weeks after sent us messages to say how good the band were. The music was certainly one of the best memories of the day. Thank you for being such a special part of the day! Hitman Trio were absolutely fantastic from beginning to end. The three guys were brilliant to deal with. They are fast to respond to emails but it was the interaction on the wedding day itself that helped so much. The lads were very cool and calm which helped me obviously to stay the same way. Their version of “Crossfire” for our first dance was probably possibly the highlight of the whole day for us. We got so much fantastic feedback from everyone at our wedding regarding the band. I really can’t recommend them highly enough!! So it’s a disgrace how long this has taken. We want to thank you all so much for being such an amazing part of our wedding day. You guys were amazing and created the perfect vibe for our reception dri ks. Everyone was saying how great you all were! Thank you soooo much and we wish you all the success in the future!! I have put reviews on the two pages also for yous. From the new (ish) Mr and Mrs Meegan. Our guests have mentioned how great you were since the day. I have to say I loved the ride on/insomnia mash up and have watched it online a few times since. Thanks so much for the music at our wedding in June, everyone absolutely LOVED the Hitmen Trio and were asking who ye were!! The dancefloor was never empty and people were raving about the band all night. The fact that you learned the “Game of Thrones” theme tune and also played Black Hole Sun in your DJ set meant to much to us! It was an absolute delight to deal with all three of the Hitmen from beginning to end. I have these amazing memories of the wedding night when I watch your YouTube videos – thank you so so much for everything! Couldn’t recommend you more highly to anyone! Johnny is a total ledge as a DJ, drummer and singer. Super talented, accommodating, easy to deal with. Everybody LOVED you guys. Would recommend you to anybody without hesitation! Just wanted to drop you a quick note to say thank you so much for being a very central part of our big day in July. It seems so long ago now, but our wedding guests regularly mention you guys! I know some of them will be at another wedding you are playing in the new year and they can’t wait!!! From the get go, you were all so helpful with music suggestions, and even agreeing to learn our first dance! Your are supreme professionals, the day ran so smoothly, from ceremony, right through to the DJ – having The Hitmen Trio do the lot was the best decision we made. The dance floor was heaving all night – I don’t think marquee floors are built for that level of dancing – but ye had people up from the sound check onwards! A particular, and unexpected, favourite was M.I.A. Paperplanes – unbelievable stuff. But I will always treasure our first dance, it was incredibly special. So, a huge thank you to you all. These guys are truly AMAZING. They made our wedding. They’re excellent musicians who bring energy, originality and enthusiasm. The dance floor was packed from the first song until the DJ (also provided by them) finished. Everyone was raving about them and one of the bridesmaids actually booked them on the night for their own wedding. I can’t thank and praise Roly and the gang more, Thank you, thank you, thank you. Myself and Cathal just wanted to say a huge thank you for playing at our wedding in Fallon & Byrne on Saturday. We were delighted with our first dance which was just how we imagined it! The dance floor was never empty and both of us are stiff from all the dancing we did! So many of our guests were talking about how great you were and the amazing medleys that you performed. Thanks particularly to Johnny who played a wonderful set at the pre-reception. The music and dancing was one of the highlights of the day for us. Sorry it has taken me so long to get in touch but it has taken us a while to recover from our wedding on Saturday! We had the best day and one of the highlights was you guys. From the amazing songs in city hall to the lively session in the Morrison it was all excellent and the only thing I am annoyed about is I missed some of the session in the hotel as we were out on a windy ha’penny bridge getting our photos done! Everyone was raving about you and I will definitely be recommending you to my bridesmaids sister who is getting married early next year! As well as getting more time to listen to you I also wanted to thank you all at the end but I think I was escorted off to get ready for dinner. I had asked the hotel to get you dinner on us in the bar I hope they organised that for you as I know you were going on to another wedding? We are off on honeymoon on Sunday but when I am back I would be delighted to write a good recommendation for you if you wish? Thanks again Roly I will be checking your Facebook page to see when you are next playing in bray to hear you guys again! Thank you so much for playing at our wedding in Coolanowle House Carlow on 16th September. I meant to drop you a note earlier but we were running around after the wedding and off on honeymoon and stuff! Ye were brilliant, we got loads of compliments from our guests. My cousin said you were the best wedding band she has seen! The music was great and ye were so warm and friendly too! My 6 year old nephew was fascinated when he saw ye setting up, asked me if I had known ye were going to be there! And great job on After All for our first dance, we loved it! Just wanted to say a massive thank you for playing at our wedding on Saturday night. All the guests were absolutely raving about your performance. The music was spot on and the energy that you guys have is amazing. We were so thrilled that everyone was dancing so much- your music got people up on the dancefloor that we never expected! So really a huge thank you. Thanks a mill for everything Saturday! You couldn’t have been better-everyone loved your set! Just wanted to formally thank you. Didn’t get a chance to say hello on the day with all the photos etc but everybody was talking all weekend about how good you were and how nice the outdoor music was . Can’t thank or recommend you highly enough. Guys ye absolutely rocked the house last night it was amazing. I think I’ll be singing ride on in my head for weeks. I would recommend ye to anyone. Ye were so so professional! Just wanted to say a HOOOGE thank you to the 3 of you for June 10th, EVERYONE loved you. I was so so HAPPY I chose you and would recommend you to anyone! You were so talented, chilled, good humoured and easy going. Hope you weren’t waiting too long for myself and Gary on the night, it was so hard to keep up with everything. You totally made the night, thank you a trillion. Dear Roly, Johnny and Romain. Words cannot describe how happy Cliodhna and I were with your performance on our special day. You absolute nailed it, catered to every age group and made our first dance so memorable. Everybody could not stop talking about you lads the next day. I cannot wait to find another excuse to have you boys attend and rock the house. All the very best and thank you so so much. Thank you so so so much for such a fabulous evening on Saturday! I’ve never seen as dance floor so full to the bitter end. You guys are such fantastic musicians – the mashups were just genius. Wow wow wow. And thanks for letting Denis play and sing with you- we both got a kick out of that. What a nice surprise. We will be recommending you far and wide. Hi Hitmen how are you? Just dropping you a quick mail to thank ye guys for everything for our wedding! We are in Thailand on honeymoon and we are still getting messages fr people about how great a night everybody had! Ye were absolutely brilliant and everything we wanted and more! We would have no problem in recommending ye to any couple looking for a wedding band! Thanks again and all the best in the future! We can’t thank you enough for the exceptional music the whole way through our day in September. Your music was a real highlight of the day, we had so many compliments. Thank you for accommodating all of our requests for the ceremony, from Summer in Siam to Sir Duke, every piece added something special to the service and of course for the packed dancefloor all night! It was the dancefloor of my dreams! I can’t remember if I got chance to thank you guys on Sat night….sorry, too many shots!! So just wanted to say big thanks for a brilliant show at our wedding. There was unanimous praise from everyone the following day, young and old, for the music. We loved it. It was perfect. The dance floor seemed to be packed all night, which is exactly what we wanted. Thanks again. Hope all well. Aoife and I arrived back from honeymoon yesterday and now we’re back in the real world we just want to drop you all a quick note of thanks for your part in making our wedding day in Rathsallagh a number of weeks ago so enjoyable. The band and DJ got rave reviews and we were delighted with how you could keep the dance floor going the whole evening. All we can say is that we hope to get to enjoy you all again as a guest at another wedding in the future! We just wanted to thank you once again for last night, ye were so amazing couldn’t be happier. Everybody commented on how great ye were… And they are a fussy bunch!!! It was a real joy to dance to yer music for the night. My nephew filmed the first dance for us and we have just watched it, we will really cherish hearing yer version of LSF forever. Once again thanks so so much for everything. Hope ye made it home safely. Thanks so much for all the great music on Thursday from the ceremony to the end. We had an amazing time all the guests are raving about you guys!! Things have finally calmed down so I can get back to you and say a massive thank you. Guys ye were absolutely amazing! Everyone and I mean everyone raved about the music both in the ceremony and the reception. I heard nothing else matters and nearly lost my life! I was only sorry I didn’t see as much of ye as I’d hoped with all the running around and organising. So happy haha thank you so much for everything. The DJ set was great 2 we never left the floor. Can’t believe I’m only sending you guys this now! What can we say about you guys … ye were amazing. We have a video of you singing “ride on” Christy Moore and we regularly look back at it and smile , the whole place erupted. Ye are so talented and such nice down to earth guys. Nothing we asked was too much from the church music, drinks reception & main reception . Your rendition of Love on top was exactly how we wanted it and il Gorno as I walked up the aisle, magical. Finally thanks for allowing Edel to join you in the church, it was the best of two worlds for us. We will be watching out for your gigs! I just want to say a massive thank you for playing at our wedding on the 29th December. You were fantastic, everyone was raving about you. The main things people have spoke about since the wedding was the food and you guys! Also, we really appreciated you doing the Talking Heads song, it was a great version. Hope you’re all keeping well and that your own plans for the big day are shaping up well Cian! We’ve wanted to email you from the moment things wrapped up pretty late on the night of 31st October to say a massive thank you for your performances…but we’re just back from honeymoon in the epic South Africa and wanted to send you an email that did justice to how impressed we were. 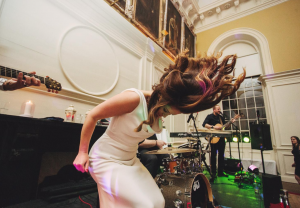 As you all probably remember, I was a bit of a control freak when it came to all things to do with the band on the wedding day, but Conor assured me we’d booked you guys for a reason and to relax. I’m glad I listened to him. You were just INCREDIBLE from beginning to end. Our only regret on the day of the wedding was not getting to spend more time listening to you during the drinks reception, because you sounded fab. As soon you you guys kicked off I knew the party had started; the sound was fab, and your energy got everyone re-energised for dinner. During the main set you had everyone eating out of the palm of your hands! From our first dance to your personalisation of some of the songs, we were blown away by the amount of thought and heart you put into everything. The dance floor was packed, and even those non-dancers were standing nearby to get a better look! Our videographers said they have amazing shots of you guys (we’ll be sure to tag or forward on when we have them) and some of our relatives have been looking you up on YouTube (not what you’d get with the average “wedding band”). You played everything we wanted to hear. And a BIG thank you to Roly for staying on and doing the DJ set, putting up with some very late night requests, and for playing EVERYTHING I asked for…Waka Waka and Klingande were my guilty pleasures and you managed to get them in there. Thank you so much for providing many of the absolute highlights of what was already the best day of our lives (“We Are Your Friends” was especially epic!). We’ll be catching you guys on a Wednesday night in Dublin soon for sure. Both Zoe and I just wanted to say a massive thanks for playing at our wedding. You were fantastic – everyone who was there were loving you guys! You sounded amazing! Unfortunately I didn’t get to hear you guys as much as I would have liked – there were a few people I hadn’t seen in years due to tours in Iraq and I wanted to speak to them as they were heading on. What I did manage to hear was brilliant and you really set the mood. Thanks so much for that. Finally, thanks for learning the songs for us! Our first dance was a little…unrehearsed! Of mice and men…Didn’t help when the entire time through it, Zoe kept saying “we look so stupid because we didn’t practice.” Self conscious much?!? I’ll leave you now – I’m sure you’re bored reading this, but I just wanted to say a sincere thanks for everything. Thank you so much for playing at our Wedding on Saturday!! We were expecting a good gig and some great craic but you blew us and our guests away!!! All of our guest were complimenting our choice and raving about you!!! You even got some of the lads involved, it was so funny!! You guys made the night!!!! You got the music/song choices perfect! Thanks to Roly for sticking around to DJ! All over it was an amazing night! Thank you so much!! We saw the band first at a gig in the Porterhouse and booked them on the spot. We knew from that performance they would put on a good show for our wedding but on the day they surpassed all of our expectations. From the drinks reception through to the DJ set they provided the perfect backdrop for our wedding; it was exactly what we wanted. They suited our venue perfectly and we got many comments and compliments on the band during and after the wedding so we felt it only fair to share them with the world! 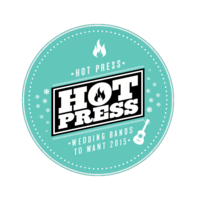 We would have no hesitation in thoroughly recommending them to anyone looking to book a band for their own wedding. We look forward to the possibility of seeing them at other weddings in the future! Lad just a short messages to say thanks a million for a brilliant job use did at our wedding In the bridge house tullamore on the 5th of August , from learning our first dance to the last song of the night everything was more then we expected, Liam had been watching your you tube videos for months Leading up to the wedding , and use didn’t disappoint, all our guest were asking about use and saying how good use were , even MARCO had fun 😂😂we hope to see use in the poterhouse soon . I just wanted to send my thanks for the amazing session you did for us in France. A few people we told you were coming were surprised we were bringing a band in from Ireland and very quickly realised why. The dance floor was full and everyone of all ages loved the music from start to finish. You were all brilliant and I hope you got to enjoy a bit of time off with the family in Biarritz. I am sure our photographer got some great photos of you all so we’ll be sure to send them through as we get them in the next few weeks. Just wanted to say a huge thank you for your unbelievable performance at our wedding on Saturday. We wanted to say in particular how special our first dance was. Your rendition of it was quite simply magical, for want of a better word! Every second of it was perfect and we wonder why we were nervous about dancing at all when we heard how amazing you sounded. We felt immediately at ease and absolutely loved it. It is something we will remember with great fondness for the rest of our lives. And that finale. We literally couldn’t have asked for anything better to finish your performance. Everyone adored it and we’ve heard so many people commenting on how brilliant you were. And finally, thank you for keeping the party going with the DJ set afterwards. You played everything everybody wanted to hear without hesitation and everything was done with a smile on your faces. Once again, thank you and we will be thoroughly recommending you to anybody we know getting married. When we got engaged in June 2014 one of the most important things to us was to book a really great band. We both love music and feel that a great band can make a great wedding! My husband’s sister, without hesitation, told us “you HAVE to get The Hitmen Trio.” After looking at their website, Youtube clips and emailing you we were sold. Your talent absolutely shines through and you are really friendly, cool guys to boot. A couple of months later we ventured into The Porterhouse in Temple Bar to check you out. At this point we felt a bit nervous. Were you too good to be true? Was what we had seen online a true reflection? We had absolutely nothing to worry about and 2 minutes into the set we looked at each other, beaming. From then until our wedding day we popped in to see you another couple of times as we had enjoyed that gig so much. We booked you to take care of our ceremony music, band and DJ. Roly, you were amazing, incorporating piano, guitar and vocals and so many people commented on the beautiful music. We were thrilled! It was really important to us that our first dance song was performed by the band. We really really appreciate that you learned ” Make me Better” by the Decemberists and blew us away with their performance. After that one dance I had so many people asking me “Who are these guys? !” And that was from a lot of people who didn’t even know the song. The energy, enthusiasm and interaction you brought, all night, was phenomenal. It was just a really fun party with amazing music and everyone was so relaxed, enjoying it all. I wish you guys every success in the future, not that you need it!!! We, and our guests are still talking about you. Thanks again for being such a brilliant part of our day! Hi lads, thanks again for doing such a great job at our wedding over the long weekend. I really can’t say enough about ye, all of our guest have put ye down as one of the highlights of the entire weekend. “Fantastic set list”,”incredible musicians” or just some of the things I’m still hearing form our guests and ye absolutely blew the roof of the barn!! exceptional stuff guys really, thanks so much. Sorry for the delay but we’ve been away sunning ourselves. We just wanted to say thank you so much for making our night brilliant. The music throughout the day and night was fantastic and exactly we wanted!!! I’m sure the heat was pure torture for you all. We’ve had many many comments on how good you guys were since the day. I’ve even had a few people say you were annoyingly good because they couldn’t leave the dance floor even in that heat. I think you might be getting some further custom from it. Special thanks to Cian for sticking with us from start to finish, I’m not sure how you did it while still smiling to the end. I’m positive we’ll see you guys again in the future, you might not notice us but we’ll give you a wave. We just wanted to say, very quickly for now, a huge thank you for adding so much to our wedding day on 22nd July in the Millhouse. From the beautiful ceremony music Roly, to the fantastic band and DJ set, the fact you sang such a fantastic first dance song for us, it just added so much to the day. We promise this will all be put into better words in a proper review as soon as we can!! Thanks again. You are just brilliant at what you do! Sorry its taken us so long to write a review! From the bottom of our hearts myself and Conor cannot thank you enough! You guys have given us everlasting memories from our big day! From your beautiful rendition of “Use Somebody” for our first dance to turning around in the middle of the dance floor to see it heaving and everyone giving it socks to “Ride on”! Words cannot express the amount of fun we had that night, and the incredible amount of dancing we did! The craic was definitely had by all! The amount of comments, texts and conversations people had about you were unreal. You passed with flying colours in both the Mammy’s eyes! And no one had a bad word to say! Everyone loved your renditions, your energy and your sound! Thanks again for the memories, and if anyone is in doubt about asking these guys to be their wedding band! Don’t be! They’re incredible! we’re just back from our mini-honeymoon, and wanted to quickly say a massive thank you for the fantastic job you did playing the main set at our wedding. From the beginning to the end, both what you played and how you played it was fantastic! It meant a lot to us that you played „The only one“ for our first dance, and that you dug out 99 red balloons for ze Germans 😀 Lots of our guests commented on how cool your set was (Plus my dad’s still raving about your version of All Along the Watchtower…). 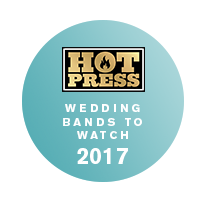 We’re very very happy that we’ve booked you, and would strongly recommend you to anyone looking for a wedding band in Ireland! … and don’t be surprised if you soon get booking requests from the continent. All the best, and thanks once again! Greetings from sunny Sorrento, just wanted to say a massive thanks from myself and Caroline for last Saturday in the Millhouse. It was a great set and everyone kept asking about where we had found you guys, a really unique wedding band. Also thanks Roly for dj’ing and Jonny for the reception music – a great day all around. It’s not often I feel moved enough to write an email following a wedding, but I thought it remiss if I didn’t drop you a line to say how AMAZING you guys were on Saturday at Jen and Andrei’s wedding. I go to a lot of weddings and you were by far the best band I have seen – people could not stop talking about you the next day! Let me know if you guys are ever in London or if I can help in any way – fancy playing at The O2?! You’re all diamonds, thanks for a cracking night. Seeing a full dance floor all night was fantastic and everyone had a great time letting loose as I am sure you guys saw! We can absolutely second that. You really did just make our night, you had everyone on the dancefloor – male and female, young and not so young. Our only difficulty was trying to prize ourselves away from the dancing every once in a while to chat to people at the bar – but luckily they all gravitated back towards the music anyway within minutes so we didn’t have to worry! Even the photographer commented that your version of Falling Slowly in the church brought a tear to his eye, and as for getting the guests to chant ‘we are your friends’ and ‘I will wait’ – just incredible, particularly on the most roasting night of the year when you must have been nearly passing out up there! We’ve been chatting about it non stop ever since – and torturing ourselves trying to remember what the ‘aww’ that you got everyone to chant was from. Can you put us out of our misery? If you’d like us to write an endorsement for your website or anything, please do not hesitate to let us know – we would happily write something glowing! What a fabulous show you put on for Aideen’s wedding. Right from the moment in the Church when ‘’Eagle’s Wings’’ put the hair standing on the back of my head to the relaxing atmosphere at the reception (shame about weather just at that moment) and then onto the dance music. Wow you blew everyone’s mind away and recruited a further 100 new fans! Right up to the finish with ‘’Galway girl’’ at the disco the party rocked with the Hit Men Trio!! Thank you so much for everything, you made it a very special day for Aideen, Jon and everyone attending including Miriam(Aideen’s mum) and me. Huge thanks for playing our wedding on May 13th. Absolutely sensational, everyone was commenting on how good you were. Highly recommended. Seriously you have no idea how much the crowd loved you. You were absolutely perfect for us and our venue. The first time we listened to you in the Porterhouse in Temple Bar we knew you guys were perfect. You were the first and only band we saw and to say we were thrilled with our decision is understatement. There were people up on that dance floor that haven’t danced since 1960 and that is no lie. We didn’t get to speak to you on the night so huge apologies. A huge thank you to whichever one of you was the DJ for putting up with requests, allowing us to commandeer the microphone and agreeing to play Maniac… twice… a true classic!!!! We had an absolute ball and thanks so much for your contribution to that. Being a bride didn’t stop me flying around the dance floor and thats what is’s all about. Just wanted to say thanks a million for the wonderful music on the 30th- everyone is raving about the music and it really was great! Ride on was fab and everyone was up for it! Anyway if by any chance you have the list of the sons you played id luv it as a memory- not sure if it’s something you would have handy or not! Roly, Roman & Cian,So sorry it’s taken us this long to get our act together and write an email to you guys, were only starting to adapt back to reality!! You played our wedding in Ballymagarvey Village on the 26th October 2015 and words can’t express our gratitude. Everyone cannot stop singing your praises since the day, from the drinks reception music to DJ’ing into the early hours of the morning, it was unbelievable. Our guests have said they would pay to go see a band like you play in an arena (who knows that could be your next move). The dance floor was full and every age group was giving it all they got all night. We couldn’t have picked a better band for the day, you really were an integral part of the day and something we won’t forget. I can’t express the biggest thank you and we wouldn’t hesitate to recommend you to anyone, wishing the three of you all the best going forward and fingers crossed we’ll come across you guys again very soon. PS- two quick things (if u can remember haha) do you know what the last song you played on the night was? Everyone was in awe by it and keeps asking us what it was and I can’t remember? Thank you guys so so much for playing at our wedding in the Seafield hotel on 2nd January 2016. You were amazing! Our guests couldn’t stop talking about how great you were. Thank you so much for playing our first dance song so wonderfully. It was perfect! Thank you all for everything and for playing our requests. I will be recommending you to all future bride and grooms! Cian, Romain & Roly, just a quick note to say thank you so, so much for your incredible performance at our wedding on October 29th in Faithlegg House! You guys were awesome! Everyone was talking about you on the night (still are!) & loved that your style is different to the traditional ‘wedding band’…exactly why we chose you! We were also very impressed with your version of our song, you did such a good job making it suitable for a slow dance! Thank you for a brilliant night! We just wanted to send you a quick email to Thank You for making our reception so enjoyable. We have had such good feedback about how brilliant you all were. You are the most talented and professional Wedding band we have ever come across and we wish you all the best! P.S. We have also passed on your details to several Brides to be, so you may be dragged up North a few more times. When we went to see you first in Finglas.. we knew that we had made the right decision to book you for our wedding in Leixlip Manor and we were so right. We cannot thank you all so much for contributing to make our wonderful day so special from the service right through to the disco. The guests all without exception comment on how great the music was and our nieces loved the special little dance exhibition which you facilitated them in preforming. 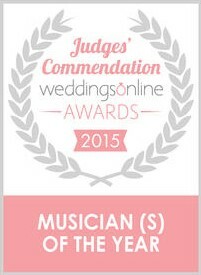 We can only recommend that anyone interested in the best wedding musicians look no further than you. Our guests are still commenting on how amazing you were , I don’t think anyone left the dance floor all night . Just back from our honeymoon and wanted to say a massive thank you for playing at our wedding in the millhouse on 18th September. Absolutely everyone complimented you and the dance floor was full all night! Roly did a great job too keeping the tunes going into the wee hours and was more than happy to play some very random requests! (Neil diamond and Buck’s Fizz !?)! So thank you so much for making our night so memorable! Just back from honeymoon and wanted to drop you a line to say a huge thank you for your amazing performance at our wedding on the 11th of September at Ballymagarvey Village. We were on the dancefloor the whole night and our guests were absolutely blown away by ye. There were a lot of serious music fans amongst us who were raving about the music, especially the mash-up at the finale. We’ve had several enquiries as to who ye were and have passed on your details. Thanks for an amazing night, and hopefully catch ye again at another wedding for more of the same. Sorry for only writing to you now, we’re only back from the honeymoon this week. Just wanted to say a huge thank you from myself and Michaela. It’s been nearly a month since the wedding and friends and family are still talking about the band! Everyone really enjoyed the music throughout the day, and night! We really didn’t want it to end. A few of our friends want to arrange a visit out to the Porterhouse with us over the next few weeks to see you, so we’ll be keeping an eye on your website to see any upcoming gigs. Whenever voting season kicks in we’ll gladly give you our vote and we’ll make sure a few friends and family do likewise. Also, if you’d like a proper testimonial, the two of us can piece something together and send it on to you. Thanks again lads, you really made our day special! A short note to say thank you to the band for playing at our wedding in Tinakilly country house on 27 Aug last. Our guests and ourselves really enjoyed the band, as you could see from the very enthuastic dancing some of the lads really got into your set! A great night was had by all. All the best with the rest of the wedding season. Hopefully we’ll see you playing some time soon. Thank you so much for playing at our wedding on the 24th July. From the moment you guys started playing everyone was on the dancefloor. Awesome music and great atmosphere. Thank you so much for playing on our wedding day on the 8th August in The Millhouse. You were amazing from start to finish. We are so glad we chose to have you do the cermony right through to DJ. We loved the music in the cermony, it made it such a beautiful part of the day. Unfortunately we missed the drinks reception due to getting photos taken but heard it was great. The main set was just supurb, I’ve never been to a wedding where the dance floor was full for the entire night! You guys gave it all you had and looked like you were having a blast too! Oue guests have been raving about you ever since! We wanted to thank you again so much for putting on such on amazing performance on our wedding day on May 9th. From start to finish you were superb. The music during the ceremony was so beautiful, we will never forget it. The drinks reception music was wonderful, and the evening music was so much fun, the dance floor was full the whole night. My mum Mary also loved being included in our song! We had an absolute ball. A massive thank you for helping make our wedding day so special and fun! Few pics attached of you performing at the drinks reception. Just want to say a massive thank you for Last Sunday. You were more then we could ever have hoped for. Everyone was talking about you. The venue, my aunt (when I’m 64!! ), my brother in law for the solo opportunity and the photographers who have a side line blog called West Coast Weddings and want to do a blog post on you. Thank you for being so easy to deal with, for meeting our every demand and learning so much new material during peak season. For playing every request for making it so personal (adding our names to song lyrics!) and for keeping a small, very mixed wedding crowd dancing all night. The oldies wanted a waltz and you gave them a waltz. You are in everyones photos and snapchats. We only wish we could bring you to Spain for round 2!!! I will be recommending you to any about to be brides, in the hope I get to see you play again very soon. Just wanted to say a huge thank you from Ceirah and I for the amazing performance in France. As it was one of my main jobs to look after (that and the suits), I can gladly say that my choice was justified. What a performance! From the over 70’s grey brigade to the 20 something’s that filled the dance floor it was clear you had all of us filled with delirious happiness. I can happily blame you three as the main cause of my calf strains due to over dancing! Thanks so much for one of the best memories for the wedding day. Keep up the good work and again, thank you so much!! Just wanted to drop you a wee mail before we head off on honeymoon to say thank you again for playing our wedding! You were absolutely fantastic and everyone was asking who the band were and saying you were the best wedding band they’d heard! You made our day extra special with all those extra little things you did like the mash ups, learning some new songs for us, allowing my brother up to perform and more! You kept the dance floor full and the disco set at the end was great as well. We would recommend you to any future brides and grooms in a second and we’re going to try and get up to Dublin to see you perform again! We honestly can’t thank you enough, you were amazing! Just wanted to send an email to say thanks so so much for doing the music at our wedding on the 5th of June in Tankardstown House. We had an amazing day and yous were brilliant, we were so happy with the music. Thanks so much, we really had the best day and want to rewind and do it again. Sorry this has taken us so long but we would like to send you a thank you message for the amazing music which you provided for our wedding reception in Balyna House, Moyvalley in March. Choosing the band was the one part of the wedding day plans which we struggled with, as we’re not a fan of the cheesy typical Irish wedding band set. We did get not the the chance to see you play until the day itself as we live in England, but we both could not have been happier with the music that you provided for our reception. Our first dance song was perfect, and all our guests really enjoyed your set. We would wholly recommend you to anyone else organising a wedding. We are finally back to work after our honeymoon! We just wanted to drop you an email to say how great you guys were on the day and the night of our wedding! Everyone we have spoken to after was raving about you guys, and we were sure to pass on your name! I think the dance floor was full all night which is exactly what we had hoped!!! We will be sure to highly recommend you to all our friends and family especially in the hope that we get to see you guys perform again at another wedding! Just a quick note to say a genuine thank you for doing a fantastic job last week – everyone was raving how unique and brilliant you were as a wedding band and we totally agreed! P.S. having the forethought to set up outside for the pre-dinner music made my day! You guys are such a brilliant band and true professionals! Everyone raved about you and I would recommend you to anyone getting married! We don’t know how to begin thanking you for the absolutely incredible performances you gave us all day. The music welcoming our guests to the ceremony was perfect. You played our ceremony music so beautifully that it really helped to make it what it was. The music for the pre ceremony drinks reception was just so appropriate. You played to the crowd and everyone loved it as there was something in it for everyone. But none of that had a patch on the after-dinner music. The energy was amazing and you had the dance floor full the whole night. Without question, you made our day. The first words from our guests afterwards were “What a band!”. Honestly it was class. If i was to offer words of advice to anyone thinking of booking you guys it would be: “Stop thinking about it – Do yourself a huge favour and book them now – I promise you will not regret it”. Absolute Legends. We hope to have to have the pleasure of seeing you guys perform again soon. We just wanted to send a quick email to say a huge thank you for playing at our wedding a few weeks back in Carrick on Shannon. we never got a chance to even say hello or thank ye for playing for us for the whole day! The ceremony music was just gorgeous and we loved that you threw in some songs I had just mentioned we liked, gave me goosebumps when I heard them unexpectedly! Everyone loved the relaxed atmosphere of the drinks reception where you guys just chilled and jammed while everyone mingled and chatted and then when you got in to the swing of the reception and started banging out the tunes it was just awesome! not kidding we love the version of riptide you did more than the original! It was great to see not only the young but the more mature guests get in on rocking the dance floor! I don’t know how many people told me they want your details, they want to book ye for when ever they get married! And last but by no means least, roly really got the place hopping til the early hours, he was on fire, giving it his all and ensured everyone had the best fun shakin’ it on the floor! It was just such a pleasure and a joy to have you guys for the whole day and we just wanted to say a massive thank you! We had an absolute blast and when we look back or hear song that reminds us of the day its cause of all of your excellent musical talents and exceptional professionalism! Just wanted to drop you guys a quick email to say thanks for the epic music you provided at our wedding at Kilshane House. Everyone loved it and it was exactly what we were after. I don’t think I came off the dance floor once! Also, was everything ok with the bnb? One of the lads was meant to give you an envelope with cash for it but I don’t think he did. Please let me know if we owe you for it! Thanks again guys! Maybe our paths will cross again at Body and Soul sometime! The Hitmen Trio are like a sneaky personal trainers. They warm you up slowly and right about the time when you think you’re going to have a lovely dignified time, they start banging out amazing medleys and perfectly rehearsed numbers that have you up dancing for hours, sweating your box off in the most expensive dress you’ll ever own, despite having no feeling left in your lower extremities. Before you know it you’ve burned off enough calories to justify a second round of wedding cake and goujons. Probably could have done with them in advance of the wedding in this regard. To say they know their audience is a grotesque understatement; there wasn’t an age bracket of guests that wasn’t motivated to get up and get out dancing by the lads talent and infectious enthusiasm. Lets be honest, I’m sure by mid-August even the most seasoned professionals have to be jaded at playing what must be almost the same gig over and over and over, but these legends made us feel like they were privileged to be playing our wedding when in fact, the opposite was true. I was on a mission to avoid all things wedding clichéd and with these guys playing from the ceremony right through to the late night DJ-ing I felt I was at a super cool party rather than a “Birdy Song”, “Sweet Caroline” and/or “Walls of Limerick” infused wedding. We felt cooler just by sheer association. With talent like this you presume some amount of ego is to be expected, and if I’m honest, justified, but these gents were as humble and obliging as they are musically gifted. They even learned and nailed a song with very rudey poodey lyrics just for our entertainment! I actually now rate the Hitmen Rude Boy Remix better than the original. Scarlet for Rihanna. As a side note, I’d also like to add that during the awkward “first date” part of the searching for your band, when you’re just a socially challenged sober couple with a notepad in the corner of a pub, they’re sweet enough to pretend you’re not sticking out like a sore thumb. Possibly because you aren’t. You will be surrounded by other engaged couples throwing deposits at them about 3 songs into their set. Heads up, If you need to see them before you book them, just bring cash and be willing to move your wedding date if they’re not available. Lads, it was a pleasure, an honour and a proper laugh! You really made the night! Thanks again! I sorry for the lateness in sending this. We really wanted to send this onto you to say that you guys were absolutely amazing at our wedding. From the church to the dj-ing we didn’t have to check anything, you guys knew exactly what to do and it made us feel so comfortable. I dont think the dance floor was empty for the whole night, it was like our own little festival. We have some brilliant photos of a full dance floor and it looks like every single person was enjoying themselves. So many people were wondering who you were and raved about you guys. Its so hard to get a cool band and you nailed it. thank you very much for contributing to our wedding day. Sorry it has taken us so long to write this. we just wanted to say a massive thank you for playing at our wedding on the 21st June in Barberstown. You were amazing! We were on the floor from the first dance to the last song in the dj set. You even had my parents who are 65 + up on the floor! The way you make all the songs your own is fantastic there wasn’t one song you played that we didn’t like. My feet were in bits the next day from all the dancing. All the guests were sooo impressed you are so much more than your average wedding band. A special mention for our first dance we choose feeling good, we didn’t give ye guys a lot of notice, but god it was amazing you made it very special for us. You’ve def made fans out of us and we will see ye again either in the porter house or in naas and hopefully at a few weddings along the way!! I hope you will forgive us for how long it has taken for this email to be sent to you, blame it on lack of communication (I thought David had sent it and he thought I had)…. What a start to marriage eh?! Thank you so so much for the amazing contribution you made to our Wedding in The Four Seasons last December. We could not have been more impressed by your wonderful performance, i think there was very few times of the night where the dance floor was empty which is what we really wanted. Your version of Rule the World for our first dance was perfect, we we’re so surprised when u started playing it live, it meant a lot to us. We had so many people raving about you after the wedding, my dad especially (and he’s not an easy man to impress musically!!). We’re really looking forward to enjoying your music at our friends wedding this December. Well done on all your achievements in the last year. First and foremost…apologies it has taken us so long to message you. You played for us the night after our wedding in Lough Rynn last December. All we can say is…you were phenomenal! We knew you were amazing but the reaction of guests was testament to how unreal you were. You’re music is out of this world. We thought the evening would be a quiet enough affair as people would be tired after the wedding, but from the minute you started to play, the room was buzzing!!! Both old and young we’re loving it. People who usually sit and watch the dance floor were up out of their seats. We were so thrilled. Guests are still raving about the Hitmen Trio now. We would readily recommend The Hitmen Trio! We wish you every success in the future. We look forward to catching some of your gigs soon. Enjoy your break Thanks so much once again. Hello Lads! I think you may be on holidays at the moment and we hope you are enjoying a very well deserved break! Robbie and I are now back from our honeymoon and my first official THANK YOU email had to be to the 3 of you. From the very beginning of planning this wedding, one of the most important things to us was the music on the wedding day. Finding you was the first thing I did and once we saw you perform at the pub in Naas, I knew right then you were the band for us. We booked you straight away, before the venue –before the dress –before anything else, that’s how much this meant to us (well really me J). During the planning we then saw you another two times in the Porterhouse in Temple Bar and every time you continued to blow us away with your talent, creativity and energy. You were also true gentlemen every single time we met you and that truly shines through at every event you play. Once we got to talking about the songs you would play on the day, we were quite specific on what we did and didn’t like as well as asking you to learn a new song for our first dance and through all of this process you were nothing but professional and accommodating. The excitement was growing for our big day, not only for our wedding and to celebrate with friends and family, but (for me especially) to have you as our band (and Roly as our DJ) on the big day! Obviously I could go on and on and sing your praises but I think you know from my excitement on the day how fantastic we think you are! So, a HUGE thank you for everything you did and for the AMAZING Job you did on our wedding day. We look forward to following your career and seeing you again soon in Porterhouse. I’ve attached the only video I’ve received so far – as you know the dance floor was going all night long and you can see that in the video. We are so sorry for not writing our thank you sooner, its been a hectic time the last few weeks. We are so sorry for the delay in getting in touch, but we are just back into the swing of married life in Vancouver after an unreal month of May. And wow, what a day it was! We had the most amazing time and want to thank you for everything on the big day. From the piano music from Roly that flowed out to the lawns during the sunny reception, to the dance floor that kept everyone going all night long. Our first dance was epic and from all reports everyone had the most fantastic night. You were amazing to work with and your style of music really suited our venue- everyone was thankful for the flip flops so they could keep the dancing going until the early hours! Thank you for helping to make it the best day of our lives, for being so easy and relaxed to work with and for being such great guys. From the looks of things you are as busy as ever and we wish you all the best in the future. If there is anything more that you need from us, then let us know. Dear goodness, can’t believe we haven’t been in touch before now… sorry, we were back to work pretty much straight away. Just wanted to thank you again for your amazing entertainment on the 24th.. we had such a ball. Just the right mix of tunes to keep the floor full all night. So many people have been asking about you and we’ve been spreading the word!! I just wanted to send you a quick mail to thank you so much for being our wedding band and DJ. So many people came up to ask us who you were and kept on saying how great you were. We absolutely enjoyed every second of it, from the first dance song(which I will always go onto You Tube to have a listen to), to all the mix of songs played and onto Roly as DJ who was brilliant – best DJ I’ve heard! We had so much fun, thank you so much for helping to make our special day so memorable. I just wanted to get in touch to say a massive thank you from Valerie and I for playing at our wedding on May 17th last. We had an unbelievable day and everyone was massively impressed with the music during the ceremony and the reception. If you ever need a recommendation or any pictures or videos from the day please let me know. Thank you so much for the amazing music at the wedding!We loved it and all my friends were raving about you! The evening went so fast I felt I danced for 5 minutes not 4 hours!!! I hope the hotel was ok and you made it up to Down for Saturday’s wedding! Lads you were AMAZING!! Im so glad we booked you for the entire day. Initially I was a bit worried that the entire day would be too much for any band but your energy from start to finish was unreal. The ceremony music was absolutely perfect, especially All you Need is Love. Back at the reception you had the dance floor literally hopping all night. The three of you are amazingly talented, everyone was commenting on how good the band were over the following few days. I wish I could upload photos on this because the dance floor actually looked like there was a concert on as it was so packed. Amazing amazing amazing, thank you so much. I know my brother in law has since booked you for their wedding and I’ve no doubt they will be every bit as delighted with The Hitmen Trio as myself and Paddy. Thank you guys so much! We just wanted to send a note of thanks for the entertainment at our wedding on the 14th. You were fantastic. We have been receiving lots of compliments about you. Cian has probably been searching for those gloves with the fingertips that light up since. Wishing you all continued success in the future. We just wanted to say a very special ‘Thank You’ to you for making our day so special back in Dingle on 29 Dec 13. We have been singing your praises ever since and almost everyone at the wedding asked us who you were. From the first email contact right up to 2am on the day when you were tidying up you were professional and great to deal with. You patiently answered all our questions and helped us with song choices and anything we needed. On the day you set up seamlessly with no fuss, sang and played beautifully for the ceremony and truly added to the vibe of our day. You had everyone young and old on their feet and rocking out from the get go. You all put your heart and soul into the performances. At one stage the crowd were surrounding us, you were playing enthusiastically and we were dancing in the middle and it felt almost euphoric. Like a ‘religious, out of body experience’ is how Dan described it! I’ve attached some photographs that I thought you might like and feel free to use them (Greg from IG Studio is the photographer). Music was paramount for us on the day and you absolutely did not disappoint! A belated but HUGE thank you for playing at our wedding, we had an absolutely fantastic day! I hope you managed to enjoy yourselves too? We really appreciate how you just showed up and got on with it, as the party was definitely in full swing by the time you guys arrived! Pat (Best Man) ended up singing in a pub in Dublin on the Sunday night, so he redeemed himself in the end! S0 thanks for being so professional, reliable, ADAPTABLE and sounding so great! I just wanted to drop you a quick email to say thank you so much for playing at our wedding in Thomas Prior Hall last Thursday. Our main aim for the reception was to have the dancefloor full the whole night and we are delighted that it was, despite the surprisingly warm December day! 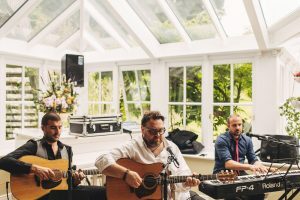 We received plenty of compliments from our guests about you and would highly recommend you guys to anyone looking for a band for their wedding – You are truly talented musicians! I registered and voted last week, I hope you win you most definitely deserve it! Things have been a little crazy for us at work since we got back, my apologies for not sending you a thank you email sooner. We couldn’t have been happier with The Hit Men Trio, as I said to you before, you were the first decision we made (before we’d picked a date or a venue) and you were one of the best decisions! From the jazz set at the drinks reception, to the acoustic set way into the wee hours of Sunday morning you were unbelievable. Thank you so much for learning our song for the first dance, honestly it was better than we had hoped! My one complaint was that your band was so good I spent the entire night on the dance floor, not sure the bride is supposed to do that, I’m sure I should have been mingling more!! I’m sure you’ve heard this a million times before but our guests had nothing but great things to say about you. You are a very unique and incredibly talented wedding band and I hope on our next trip back to Ireland we get to hear The Hit Men Trio play again, and I wish you every success in the future. If you’re ever looking for someone slightly different to play, I’d highly recommend a trip to Western Australia! Thanks again to yourself, Cian and Roman! A massive thank you for your performance at out wedding on Friday – ye were amazing and everybody loved ye! Best of luck in the future and hopefully we will get to see you again soon! Hi guys, . You are absolute legends and should run away with that award! Good luck and thanks again for makin our day so extra special. Will be sending a mail to claim my treat of ride on… The lads were talking about it recently and definitely stands out as a legendary rendition enjoyed by all. Already voted for ye last week for WOL Best Wedding band! 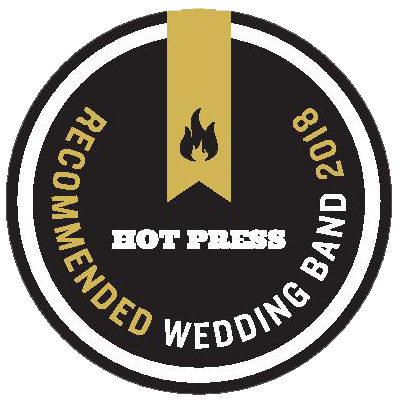 Best of luck ye deserve it, you did an amazing job at our wedding and every guest we spoke to thought ye guys were the best wedding band they had seen and complemented us on our choice! Even looking at the wedding video the dance floor was never empty! Also how you came to my rescue when I messed up over getting you to do DJ too was so great, you have no idea how much I appreciated it. When planning a wedding I was always told the most important things to get right are the food and the music, well I am glad to say we definately nailed the music when we booked you guys! Thank you so much for an amazing evening. I am only starting to think about thank you’s this week,,, but your has to be the biggest. I have never had so much fun at a wedding, the music was unreal and you guys made the night. We both could not of been happier with how it all turned, you are legends! Will post on your Facebook page too and i just voted on the weddings online site, let me know if you need anything else! I will get ciaran to do this too, double the votes! Will keep them crossed you win, you deserve it! Best of luck with all the new arrivals coming, thank you all sincerely for playing for us. We got photos last night, which i will send on, some super fun ones! Lads thank you so much for playing our wedding on Saturday night! You may have noticed we both enjoyed the music!! Everyone was talking about the music the next day and we will def be keeping an eye out on your website for upcoming gigs. Will buy you a pint! The Hitmen Trio REALLY did make the night. Everyone commented on how brilliant you were and we cant recommend you enough. Cant wait to pop along to your next gig. We’ve just returned from a few days away after the wedding and finally recovering from the wedding madness 🙂 I have to say that my favourite part of the wedding was the music and the dancing, especially our improtu first dance to you guys singing the pogues for us in the bar in Brook Lodge. Thank you so much for rolling with the fire disruption! And thank you for the great songs when we finally got around to the dancing part of the night. Really appreciate it and the Dj- ing aftewards. We will be recommending you whenever we hear of a wedding! We’re just back from honeymoon and wanted to email to thank you’s for all the effort you put in on our wedding day to make it so different and special. The music for the ceremony was fantastic and we feel it really made the ceremony extra special. Your version of Ben Howard only love and lumminers ho hey were amazing and will forever make us think of that day. We really wish you all the success in the world with the band and will definitely be recommending you to people. Just back from our honeymoon so apologies regarding the delay in getting back to you guys to say a huge thank you for performing at our wedding. And also Roly, a huge thank you for the dinner music also, fabulous! Exactly what we were looking for! I have to say guys, yous totally exceeded my expectations! I love it when that happens! And what a lovely bunch of guys you are! We would have no hesitation in recommending you guys to anyone and will be watching out for any live gigs so we can catch you again! We just wanted to drop you guys a quick mail to say a huge thanks for last Saturday night. You guys were brilliant, as we knew you would be. People have not stopped praising you guys and rightly so. You had the dance floor hopping all night and finished off what was an amazing day for us in a great way. Looking forward to seeing you guys again in the future. Just a quick email to thank you guys for such a wonderful day of music on August 16th in Dingle. From the very first email I sent you over a year ago you were fantastic to deal with. Living abroad, communication with suppliers can be one of the toughest challenges as emails can often take a lot more time than a simple phone call and many suppliers can take days to reply which can often be frustrating. No question was ever too big or too small for you however and your speedy responses to my many questions put me at ease straight away. I can’t say enough good things about your music on the day itself All our guests commented on how you were one of the best wedding bands they had heard. Other brides have often said to me that the first half hour of the church goes by in a blur and they can barely remember it. One of my most memorable moments of the day however was walking down the isle and thinking how beautiful the ‘Ludivco Einaudi’ song that you had learnt to play for us was and for that I thank you. In fact here were many moments throughout the day when I was touched by the music whether it was Cians fantastic rendition of ‘Rose of my Heart’ or the wonderful music you played at the drinks reception, during dinner or at the after party. Without a doubt we will both be recommending you to friends and family. We both wish you all the best of luck in the future and there’s no doubt that there are great things ahead for you guys. We hope this email finds you all well? Sorry it has taken us so long to write to say thank you, its been hectic since we got back to Australia and we haven’t managed to find time. We cant thank you enough for all the effort you put in for our big day it was an absolute pleasure to deal with you all. We and all our guests thoroughly enjoyed your performances from start to finish. From the ceremony through to DJ set we enjoyed every second and it was better than we had ever hoped. We really appreciate the trouble you guys went to for our ceremony music especially (and our first dance), it was so important to both of us to set the tone for the day and we were blown away. All of our guests were full of praise and compliments the day after. It was everything we had wanted and have been recommending you to any one that will listen to us since. The Castlemartyr also paid you all massive compliments and mentioned that you were the most professional band that they have ever worked with. Wishing you all every success in the future, and hopefully our paths will cross again. We just wanted to drop you a quick line to say how grateful we are to you guys for rocking our drinks reception! I obviously loved it but so many of our guests said how they’d never seen a band get a drinks reception going like you guys did! We also got a lot of comments on how amazing the singer was who sang the nick cave song during the ceremony. I couldn’t see which one of you it was but you sounded as good as nick cave himself! Thanks to Roly too for playing Hoppiolla so beautifully. You are all so talented you deserve every success! If you see a blonde who looks vaguely familiar throwing some shapes in front of you on Aug 3rd, that will be me! I believe you’re playing at my friend Sineads wedding in Clonabreany House. See you then and thank- you all again! Roly Cian Roman Fair play. Up in the hills overlooking the beautiful Sorrento and remembering our wedding which I can’t believe was 2 weeks ago already. We just wanted to say a huge thank you to you guys, you really played an amazing set for us. It was great to see the dancefloor full all night and so many people asked about you and said you were like no other band they had heard before. And you definitely have a new fan in Daragh’s 72 year old uncle who was up giving it loads to Mumford & Sons! Thanks for an amazing night, you really made it special as I knew you would when I first heard you play. PS Amazed at your rendition of “Ride on” at the end of the night…bringing our private joke to the forefront of our last dance… its like you knew! so funny. Just got back from an amazing honeymoon and wanted to drop you a quick line to say thank you so much for an amazing day. You made the whole experience easy and special from the moment we booked until the last song of the DJ set. We were delighted with the choice we made of booking you guys both in the song selection, and performances throughout the day, The passion and professionalism from all three of you was evident to all. Everybody was talking about the music for the next couple of days which was a great testament to the day. From Roly’s lovely set during the ceremony to the lovely set outdoors on the terrace, a beautiful piano set during dinner to the rocking during the night of the band set and the DJ it really made our day. Needless to say we would not hesitate recommending you to anybody thinking of booking you for their special day and we wish you guys all the very best for the future. Many thanks again and we hope to see you again very soon. We’ve just arrived back home after a whirlwind honeymoon, and wanted to email to say a big thank you to all three of you for a great set last Sunday. The music was perfect, and everyone loved sitting, eating or dancing and enjoying it properly with/without their hangovers. You gained a lot of fans last week, everyone from the little kids to the oldies! There were lots of comments about your version of songs being even better than the originals (I was particularly blown away by your Elbow cover). We wish you guys all the best for the future, and hope we get to see you again. Sorry for getting back to you so late after the wedding. When we returned from honeymoon we had another wedding the following week. Things are only getting back to normal now. We just wanted to send a mail to thank you so much for all your hard work on the 9th. We have had nothing but great feedback about the music. A special thanks to Roly who was with us for the entire day. Also we really appreciated how you included the kids. They had a ball! Thanks a million. We will definitely be recommending you. Thanks so much for playing at our wedding in Moyvalley. The guests are still chatting about how good you were and we both feel the same. I do hope to get to see you again, maybe some evening in the Porterhouse! All the best for the future and I hope we’ll meet you’s again sometime! Just to say a huge huge thanks to you for your entertainment last night, it was amazing. One memory that will stay with me of yesterday was the entire crowd singing back the harmony line of Little Lion Man, there was nobody left sitting at a table, & thats as good a testement as you can get! My only apology is not approaching you to settle the bill, so apologise to Cian for me, I know how annoying it is having to ask for payment after a gig because i’ve been there & it was in my head to do only I got caught-up chatting! But the money should be in your account by now. I hope you got back safe & sound, by the sounds of the reviews we were getting last night you will be getting much repeat business from our guests, & we will be forever greatful for the show you put on! We couldn’t have had a better night. Thank you so much. ‘Best wedding band ever’ was the most used phrase at breakfast the next morning! Hi Roly, Roman and Cian, to say you guys were amazing at our wedding would be an understatement! We wanted to party on the dance floor on our wedding night and that we did, along with our guests! The Hitmen Trio have such a great collection of songs with their own twists. Thanks also due to Roly and Roman who were with us for the full day, providing great music during the ceremony and drinks reception. A massive thank you for learning some songs for us, Air All I need, and The Turtles Happy Together. Brilliant! Best of luck with everything in the future, continue doing what you do, its perfect! Thanks, Lynn & Lonan. Hi Guys….apologies for this very delayed note but we have been on a go-slow since returning from a very long honeymoon. Thank you so much for making our wedding day such a day to remember!! We so impressed with you guys and the variety of music you played to make each part of the day so special. From the Church to the reception and getting the party properly kicked off after dinner and continuing on into the wee hours of the morning….you put in a serious effort and we enjoyed every second of it! My biggest worry was an empty dancefloor on the day and I really shouldn’t have worried.It was jam packed all night long with all ages getting involved. Our guests have been raving about you guys since…your mix of Ride on & Insomnia was truly legendary!The place went CRAZY!!!! I am surprised you guys managed to finish up at all with that crowd demanding “one more tune” about 10 times over!!!! Love it!! We hope that you guys enjoyed your trip to Kerry in November…Hopefully we get to see you guys play again…we will be sure to keep an eye on your gig list when we head back to Dublin. Just back from our honeymoon and only getting a moment now to say thanks for your set at our wedding it was a amazing, as we knew it would be. All I would say to anyone looking for a Wedding Band is to stop looking right now as these guys are the best. As confirmed by all of our guests, we had a lovely venue, lovely church, lovely food you name it but all people kept saying was who are those guys that band were unreal by far the best anyone had seen from younger cousins and friends to older aunties and uncles. Andrea and I would like to thank you for kicking the party off in Carton House on 27th September. “Great band, great songs” and most importantly, “got all age groups up on the dance floor”…..We couldn’t agree more! Hi Roly Cian and Romain! Got back from honeymoon a couple of days ago – only hit me this morning when i was on the tube that it’s all over! What an amazing few weeks the whole thing has been. Really can’t thank you and the boys enough. From the word go, I couldn’t have asked for more from you – you were great to deal with, open to all our ideas and I could just tell we were on the same page – had no worries at all about the music on the day – we wanted it to take centre stage and your presence all day and night was greatly felt by everyone. The ceremony music was beautiful – you really made Geraldine feel at ease and were so accommodating getting the arrangement right with her before the big day. I can’t wait to see the video and hear it all again, as its just seem to be over so fast. Very moving ceremony and just the exact vibe we wanted. Also dying to see our first dance again – just felt like a dream – I thought we were getting a recording and for you guys to have performed Tightrope live was incredible. Getting the Irish Vs Scottish sing off going as well was a tremendous feat, we are a rowdy bunch and your energy kept us going all night. We are happy to provide you with any references you need in the future, although I’m sure you won’t even need them as your reputation will now proceed you! Best of luck with everything and hopefully we’ll see you again one day. “We really can’t thank you guys enough for the pure professionalism you showed on our wedding day. Any request was met with a smile and grace ( even learning one of our favourite songs and playing it for us on the night!!! ). The Hitmen Trio truly made our wedding day one to remember playing a great setlist that had the crowds attention all night. There wasn’t one person there who didn’t comment on how amazing the guys were. Thanks again, Steph and Colin”. I just wanted to write and say a MASSIVE thank you for making our wedding so fantastic! You guys were unbelievably good. The energy and enthusiasm you all had was amazing, and you are such talented musicians. You were the perfect band for us, we couldn’t have asked for anything more. It’s a real testament to how brilliant you guys are that not only have our friends been raving about you but my godfather who is in his sixties also texted me to say he was blown away by the band! Anyway I think you have some new fans and I’m sure you’ll see some of us at one of your gigs in the near future! Just wanted to drop you a quick email to thank you for doing such a great job at our wedding in the Village at Lyons in August. All of our guests raved about how fantastic you were and everyone had sore legs to match the sore heads the next morning with you lads keeping the dance floor packed all night. Your set list was exactly what we hoped for and we were delighted that you kept the night going so late! We will most definitely be recommending you to anyone we know planning a wedding or event. I just wanted to say a big massive thank you for making our wedding 25th Aug so amazing, we couldn’t have asked for anything more! We had a BBQ the day after the wedding & you guy’s were the talking point, everyone one was raving about how good you were! I would especially like to thank Cian for making our first dance “Let there be love” so special, Liam & Noel wouldn’t have done as good a job!! Completely blown away by you guys. The love for you was immense! Felt like you were all just part of the gang! We all just wanted to hang out with you! Thank you just doesn’t cut it! You made our special day perfect! Could not have been the same without you. All the best for your own big day! Sorry it’s a delayed thank you coz we just got back from honeymoon – but wanted to say a huge thank you for such an amazing wedding gig on the 19th. As you may have noticed we all absolutely loved you guys. Have had loads of comments from people about how great you are. So thanks again you really made the night for us!! Where do I begin…..I will never have enough or the right words to describe what an amazing day we had for our wedding in Marlfield. It was truly magical! Your involvement in our wedding by providing all the music was a highlight, all our friends and family have commented on what an amazing band you are. One Day Like This by Elbow, performed during the ceremony proves to be the most topical discussion point, there was tears and goosebumps all round, and that was just the men commenting!! We know how truly blessed we were and really did have the day of our dreams. The continued expression being used by all our guests is “…. it was without doubt the BEST wedding we have ever been at, BAR NONE and that includes the best band ever!”. Your energy and passion and incredible raw talent was evidenced by everyone there. Roly, your involvement in helping us pick the music for the day ensured we had a truly personal music experience during the ceremony, drinks reception and the party after dinner. I cannot thank you and the guys enough for creating such a bespoke, warm and fun experience for myself and Neil and all our guests. With warmest regards and the greatest of gratitude! PS – see you in the Orchard soon hopefully! THanks for an excellent job lads.These men are serious musicians…ive been to 4 weddings this year and the bands were mediocre at best .The hit men trio are one of the best live bands ive seen this year full stop. Very accomadating at an unbeatable price. I also have been told by my relatives that the band had great crack with the kids.the only way I could have had a better band is if i went back in time and hired led zepplin. best of luck for the future lads. I just want to take this opportunity to say a huge thank you for playing at our wedding and for making the trip to Sligo…You were great! Our only regret is that we didn’t get to chat to you more with everything that was going on-hope you didn’t think we were being rude. It was just hard to get a few mins away from people. A lot of people commented on how good you were. Thanks for all the hard work learning our songs and for getting the crowd warmed up for the night that was in it! A couple of friends of ours are interested in signing you up for their wedding so we passed on your details…hope this is ok! Hi Guys – thanks so much for your amazing music at our Wedding. Having seen you play live before, we knew that you were the right choice, but you really brought the house down on the day. We could not have asked for more. You are fine musicians and a pleasure to deal with. We would have absolutely no hesitation recommending you to anyone looking for a top quality band. First off thanks so much for being one of the highlights of our wedding. Everybody was RAVING about how amazing ye were. Ye suited the whole vibe of the day and got the place rocking right from the start right until the end. It felt like a gig at the end with everyone roaring ‘we want more’!! Also a special thank you for taking the time to learn Bright Eyes First Day of My Life, it was the icing on the cake. I wish ye all the best for the future and will hopefully catch up with ye again at another of your gigs. Hi! Check us out on One Fab day and testimonials and feedback from Brides and Grooms.. Thanks so much for all the work you put into the wedding Roly, it was genuinely fantastic, loved November Rain walking up and aisle and You’ll never walk alone was the highlight of the day I think… So many people commented on how much they loved the music at the church and thought the piano during the meal was lovely and not forgetting the band after the meal, our DJ commented that it was the best band he has heard at any wedding he has played at and I would have to agree.. We had an amazing day and a lot of that is down to you. You guys were brilliant on the day of the National Student Challenge. It’s a pity that we were restricted by time as I would have liked the drinks reception to go on for longer with you playing at it! I have no doubt that we will meet again in the future, I have you firmly at the top of my list for any other events where we need a band, I’ve also spread the word to friends and family! What can we say only a huge THANKS for amazing music at our wedding in Wineport. We had the best day and the music played a huge part in that, all our friends loved you guys and I know you’re already being recommended for other weddings people were so impressed. You guys are brilliant and we really appreciated it on the day.